We hope your 2015 is off to a great start! If your new year resolution included refining quilting/piecing skills, learning how to quilt on your domestic machine, or decreasing your UFO stash--skim through our store class and retreat lists to help fulfill your mission! Remember--we are a Handi Quilter dealer to help you if you need education or want to purchase a machine. We are an Elna dealer for sewing and embroidery machines. We would love to let you take a test drive on either of these awesome brands! March 5th-8th--open enrollment Quilt Mercantile UFO retreat--join this retreat by yourself or with other friends. No project--just time to yourself to sew and make new quilting friends! click here to look through retreat calendar for available dates or retreat information. Crazy Patchwork classes by Alice Wilhoit--Sat. February 14th & March 14th. The first class, you'll learn how to build a foundation block to embellish on at the next meeting. Alice will supply pattern for class. A published author on this timeless process, Alice is the perfect person to inspire you to create your own unique family heirloom. The second class will be your time to embellish! The sky is the limit and you will personalize this block to be "all about you". Alice will show you all the short cuts and time saving tricks she has learned while making her own crazy patchwork quilts. Caution! Crazy patchwork is very contagious! This is a two-session class. It's $40.00 if you just want to take one session and $60.00 for both sessions. This picture is blk#1 in her newest pattern--Fancy Flowers. Dear Jane by Sarah Francis First Saturday each month 10-3 for $10. Dear Jane is the ULTIMATE Sampler! Join the craze known as Dear Jane...recreate this Civil War era quilt with it's small, interesting blocks and triangles, mainly by machine with applique blocks by hand. This class is taught by technique and you are guaranteed to come away learning a shortcut or two, and/or new techniques. Let Sarah help you with fabric selection. She will take all the "wonder how she made that one" out of it for you. Dear Jane book required. Embroidery Machine BOM class series by Brenda Jeschke Saturdays Feb.28th, March 28th, April 25th, May 23rd, June 27th, & August 29th from 9:30-3 for $30. The New Year brings a new program to the shop for machine embroidery; we will be offering the Smith Street Designs embroidery quilt "Feels Like Spring" as a 6-month block of the month program. During the 6-month program you will learn a different multi-hooping technique each month. Your machine must be able to stitch a 5x7 stitching field or larger to participate in this program. OR do you have a project you really want to make or stitch but you are not sure about how to start or what is the best way to work on the project. Then bring your own BOM and get help from Brenda on your own project. Now is the time to expand your knowledge and build your confidence using your embroidery machine. This program is beyond the basic instruction so you must have working knowledge and use of your embroidery machine. Below is a partial picture of "Feels Like Spring." 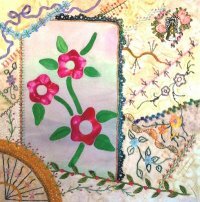 Hand embroidery class by Alice Wilhoit Thursday March 26th from 10-4 for $45. Spend a few hours with Alice and learn all the stitches you need to know to stitch beautiful embroidery stitches. Just a few stitches can take you a long way with the patterns on the market today. Technique class. Everything you need (except hoop) is furnished in a kit. Price includes this kit. Just bring your scissors and come join the casual fun. Kit is furnished. Bring 5" embroidery hoop, Scissors, Whatever embroidery floss you have on hand. Beginning Quilting by Lynda Lindstrom- Sat. April 11th from 9:30-4 for $40. This class will take you from cutting to binding in one six-hour class. We will cover rotary cutting, simple piecing, borders, making the sandwich, machine quilting, squaring the quilt, and binding. What’s the catch? The project will be a candle mat or table topper. The only way to experience a “quilt-in-a-day” is to make a very small quilt. I will share a wealth of quilting knowledge and tips with you as you make this small project. This is for students who are truly beginners and need an introduction to our craft. Tell your non-quilting friends so they can become quilters too! Level 1: Basic Pantograph Long Arm Quilting class Wednesdays 9:30-3:30 for $150. Learning to stitch a pantograph pattern on your quilt is an easy and fast way to make your quilt look like you had a professional quilted it. The basic steps will get you started on learning how to put a nice pantograph design on your quilt. Jackie will teach the six steps to get started becoming a confident long arm quilter. Level 2: Custom long arm quilting class Wednesdays 9:30-3:30 for $200. Would you like to learn how to make your quilts stand out with some custom quilting? This class will teach you the basics of custom quilting. It’s fun and you can use your creative mind to enhance your quilt. You can say you quilted it and had fun doing it. Jackie will teach seven steps to get started becoming a custom long arm quilter. Level 3: Artistic Custom Quilting class Wednesdays 9:30-3:30 for $250. After completing Level 1 and Level 2 classes you are now on your way to Artistic quilting. This class will take you to the level of a professional quilter, with lots of practice, patience and determination! You can make your quilts stand out in a crowd. Your family and friends will ask if you had a professional quilt it, and you can proudly say, “I quilted it”!! Jackie will teach the six steps to getting started to becoming a Artistic Long Arm Quilter. 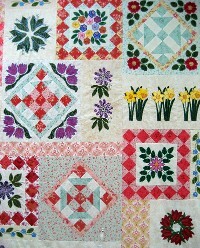 Long Arm Quilting Club March 21st. This club's goal is to bring together long arm quilters in our area. Club is open to everyone--any brand long arm on table or sit-down units. Just trying to decide IF you want to be a long arm quilter--join us on club day. We want to educate, share ideas and have fun. Jackie Brown is our lead educator for this club. At 9:30 we will begin with a Show-n-Tell so bring any project you want to share. At 10:00 Jackie will begin her discussion and demonstration of her featured ruler and favorite rulers by Handi Quilter. (20% discount on the new featured ruler on club day. If you want any held for you please send an e-mail). The first club day this year is Saturday March 21 from 9:30-12:30. Cost is $20 per meeting per person. ***Want hands on experience? Jackie is offering an afternoon class to work with these rulers from 1:30-3:30 for $35 per person. You will practice in detail how to use the rulers shown that morning. The afternoon is class limited to six students. Sign up now! Freezer Paper Starch applique class by Pearl June 25th or October 15th from 9:30-4:30 for $55 "The" Pearl Pereira of P3 Designs is coming (from California) to the Quilt Mercantile classroom. She will be available for a one day class teaching her freezer paper starch method. We are currently taking names to be on the backup list...limited space in class.